Easy ride up the hill. The banana daquaris were fantastic and the Mountain Top views were great. The banana daquaris were fantastic and the Mountain Top views were great. The tram ride up the mountain was breathtaking. Great views and wonderful shops. I loved having our picture taken with "Lady Gaga" the burro. Loved it. People were friendly. Great views, good food and drinks. Beautiful views and a nice bar and restaurant as well as shopping at the top. We did this following the Kon Tiki boat trip. Great views. Love the bushwacker drinks. We were disappointed to learn that the parrot show is no longer there. Saved a couple of bucks purchasing tickets on board. Saved a couple of bucks purchasing tickets on board. We won&apos;t need to do it again but it was worth it for the pictures we took. Unfortunately, I don&apos;t have access to the pictures right now to upload. We were impressed by the outstanding views and relaxed as we enjoyed drinks and appetizers at the restaurant and stores there. .
Quick and pretty view but not much else up there. They cram 8 ppl in a bucket and they never stop moving so loading and unloading was a little difficult. The bar at the top was expensive but the views were beautiful. Consider taking a trip to the highest point on the island for the best view! Consider taking a trip to the highest point on the island for the best view! 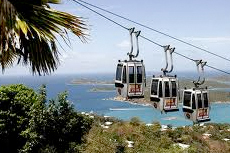 The skyride only takes you to approximately 700 feet of elevation versus the mountain top tour which is close to 1,500 feet high and overlooks Megans bay. Relatively short wait at the lower terminus, gorgeous postcard-quality views at the top, and no high-pressure sales pitches at the top, although I purchased a much-needed wide-brim hat from the shop there. Highly recommended. Great time riding to top of the mountain, fabulous views. Great time riding to top of the mountain, fabulous views. Usual port shopping at top of mountain. We were able to easily walk to the Skyride. Incredible views on the sky-ride up and great drinks at the top. Took a tram to Paradise Point and enjoyed the breathtaking view. It&apos;s a gondola ride to the top of the mountain, with a restaurant and some shops up there. It&apos;s a gondola ride to the top of the mountain, with a restaurant and some shops up there. The view is nice enough, but it&apos;s not something I&apos;d do again. Paradise Point - WONDERFUL - Most beautiful views I have ever seen Breathtaking and have a bushwacker ! The skyride was fun and the views are AWESOME!!! The skyride was fun and the views are AWESOME!!! Well worth the taxi ride to get there. You have to have a Bushwacker...best Caribbean drink! Excellent view of the harbor from this vantage point. Excellent view of the harbor from this vantage point. Well worth the money. If anyone in your party has difficulty with steps, you need to climb an equivalent of 2 flights to get to the ride platform. Easy tour to high point on island, excellent photo opportunity, short enough to allow some time to do a bit of shopping before returning to the ship.